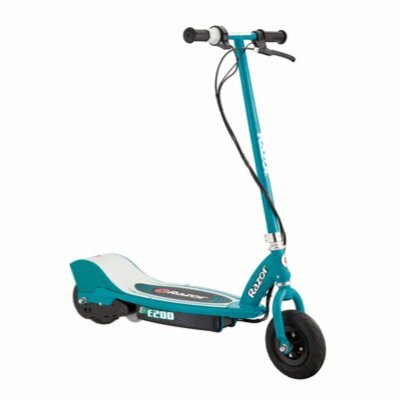 Looking for advice on buying the best electric scooter, or simply for detailed electric scooter reviews to help you make your decision? 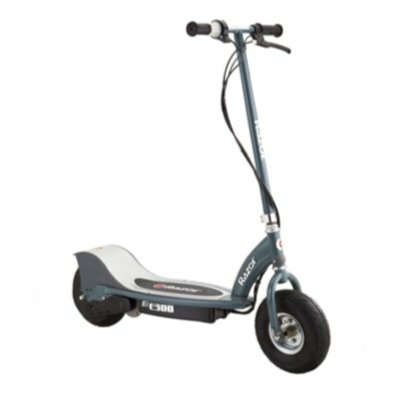 On this page you will find detailed extra information on electric scooters to help you buy the best scooter for your needs. We have many posts here discussing specific needs, such as 3-wheel electric scooters for kids or electric scooters for kids with seat, just for starters. This will help you quickly find the scooter or bike you need. Electric scooters are perfect for kids to play with. Their low power and low maximum speed means they are much safer than gas-powered scooters or bikes, although you can still have plenty of fun with them. The top brand, topping both ratings and best sellers lists at major retailers like Amazon, is Razor. The Razor family offers both electric scooter (the E series), as well as electric dirt bikes (the MX series). The Razor E100 electric scooter is an entry-level electric scooter recommended by the manufacturer for children that are at least 8-years old. It is not too fast or too powerful to learn to ride and enjoy. Only problem is that it is too small for the parents to ride as well! Keep reading to learn more about its top speed, battery charge, age and weight limits. A top speed of 10 miles per hour is pretty fast for an 8 or 9-year-old boy or girl: fast enough to be exciting without being dangerous. The manufacturer does not recommend it for children younger than 8-years-old even though some people have bought it for their 6 or 7-year-old kids. The child should wear at least a bicycle helmet and maybe some elbow and knee pads as well to prevent injury should he/she fall while riding at top speed. The maximum recommended rider weight is 120 pounds. Anything more than that and the scooter will perform poorly with much less speed and range. The Razor E100 needs a push-start to about 3 miles per hour before the throttle is used because the motor is not powerful enough to start from a stationary position. The chain sometimes needs to be tightened if it falls off during riding. The chain-drive cover is large and tends to scrape on the ground when turning to the right which can cause the back wheel to lose traction. This is a design flaw that can be annoying. It might be fixed by simply taking the chain-drive cover off. The twist-grip throttle does not have variable speed, so it is either full speed or no speed. This makes it difficult to adapt the speed to the riding environment. It also accelerates quickly and new riders must be prepared for this initial speedy surprise. You can’t go slow on this scooter, unless you are going up a hill. The hand-operated front brake takes a little time to bring the scooter to a halt, so do not rely too heavily on it. The E100 scooter comes with a pair of 12-volt batteries and its own charger. Recharging the battery takes 8 to 12 hours and is best done overnight so the scooter is charged and ready to ride during the day. Remember to charge the battery before giving it as a gift so that the scooter is ready to ride right out of the wrapping paper. A pair of 12-volt batteries, a battery charger and tools for basic assembling is included with the purchase of the Razor E100. The Razor electric scooter series starts with the Razor E100. Offering a 10mph maximum speed and up to 40 minutes of continuous ride time, this is a great entry level model to start with. At just over $100 it is affordable as well. The Razor E200 electric scooter occupies the spot between the less powerful E100 and the faster E300. This makes it a good choice as a transition scooter for children aged 10 to 12. It is too small for adults to use. This article presents an overview of the Razor E200. The Razor E200 has a chain-drive motor which powers the scooter to speeds of up to 12 miles per hour. This might be too fast for 8-year-olds, but it depends upon the weight, height and balance of the individual child. It is probably safer for 10 to 12-year-old children. The electric motor is quiet and will not annoy the neighbors or disturb the dogs. It is also strong enough to start from a stationary position without needing a running start like the Razor E100. The speed is controlled by turning the single speed twist-grip throttle. It accelerates quickly so be prepared to hang on and keep it straight. It has a hand-operated rear brake for stopping it. This scooter does not have a seat you can sit on but it has a large deck and frame for riding while standing upright. If you really want a seat then you might consider buying the Razor E200S seated electric scooter. Basically the same scooter, it just has a removable seat and seat post. The front and rear wheels have 8-inch pneumatic tires for a softer ride. The problem with the pneumatic tires (apart from getting a flat tire) is that the scooter does not have much ground clearance and might scrape on the ground when going over a bump in the road or through a hole. The Razor E200 is not made for riding on rough gravel roads or for riding in the rain. 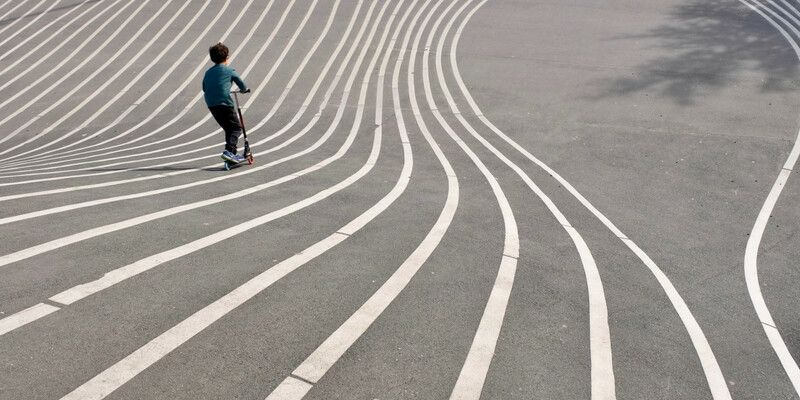 It is better to ride it on relatively flat areas and sidewalks. The electric motor is powered by two 12-volt sealed lead acid (SLA) batteries which take about 8 to 12 hours to recharge with the included battery charger. The scooter might run for 30 to 45 minutes on a single charge. The Razor E200 weighs about 45 pounds and measures 37 x 16 x 42 inches. The maximum recommended rider weight is not entirely certain and can vary from 150 to 220 pounds. Riders weighing more than 200 pounds will probably experience reduced speed and shorter riding times. The Razor E200 may reach speeds of 10 to 12 miles per hour which makes adult supervision necessary, at least until the child has had enough practice to ride safely. Wearing a bicycle helmet is highly recommended and adding some knee or elbow pads are always a good idea. The scooter is shipped with two 12V sealed lead acid batteries, the battery charger and tools for easy assembly. A slightly faster version of the E100. This baby can go at 12mph and offers up to 45 minutes of continuous ride time. Suitable for kids 10-12 years old, this slightly larger model is worth considering if it matches the age range of your kids. The Razor E300 electric scooter is an exciting way for older children or teenagers to ride around the neighborhood. Even adults can ride it if they do not exceed the maximum weight limit. Its electric motor is more friendly towards the environment when it comes to air and noise pollution. Here is a short review of the Razor E300 electric scooter. The Razor E300 is suggested for children that are older than 12-years-old, or for teenagers. It has a large deck to stand on while riding and its maximum rider weight capacity is around 200 pounds. However, the closer to 200 pounds the rider weighs the slower the scooter will be and the less distance it will travel before the battery runs out of power. If you want to ride sitting down then the Razor E300S seated electric scooter is exactly the same except for the added seat and seat post. The chain-driven 300-watt electric motor makes this scooter quiet and fast with a top speed of 15 miles per hour on a flat, smooth surface. The battery charge may last for anything from 25 to 45 minutes. This can be influenced by rider weight, battery age, tire pressure and hill climbing. The battery system consists of two 12-volt SLA rechargeable batteries which are supposed to be rechargeable for up to 300 cycles. If you ride it often you might have to replace the batteries each year. The electric motor will automatically shut off to prevent it from overheating if a hill is too steep to climb. Let the motor cool off for a few minutes before starting it again. This can be annoying, so if you are close to the weight limit a more powerful scooter would be a better choice. What is the point of buying an electric scooter if you need to push it up a hill? Turn the twist-grip throttle to make the scooter move forward quickly and squeeze the lever of the hand-operated brake to bring it to a stop. The scooter rolls around on an 8-inch pneumatic rear rubber tire and a 10-inch pneumatic front rubber tire. This makes it a little softer to ride than a scooter with solid urethane tires. Purchase of the scooter includes the two 12-volt batteries, a battery charger and a few tools needed for assembling the scooter. Finally, for larger kids you have the Razor E300. With a maximum speed of 15mph, this is a zippy little scooter, larger and sturdier than the previous two models. Capable of handling moderately sized adults, while still being suitable to children, this is a nice versatile scooter. 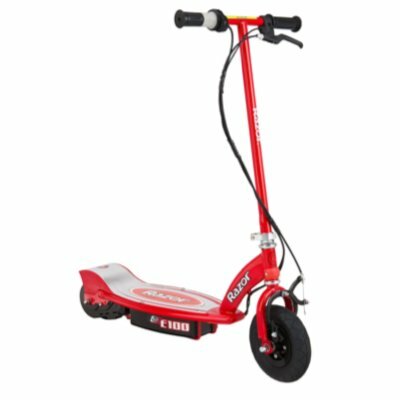 Which scooter is the best buy for an 8-year-old child? Well, the scooters mentioned above are in the $100 to $300 price range which means price is not a big deal breaker, unless you can get a special price from a shop. The next thing to consider is the reliability of the electric scooters. Problems with batteries that are old and won’t hold a charge do occur. The same goes for belts or chains that fall off or break. Sometimes loose wiring causes the scooter to quit working. The Razor scooters generally have better customer support than the X-Treme scooters, so keep this in mind if you do have to replace a faulty part. The last thing is the ride quality. These electric scooters are for beginners and speed is limited to no more than 10 miles per hour. Maximum speed depends entirely upon the condition of the battery, the weight of the rider, the riding surface as well as the incline or decline of the terrain. 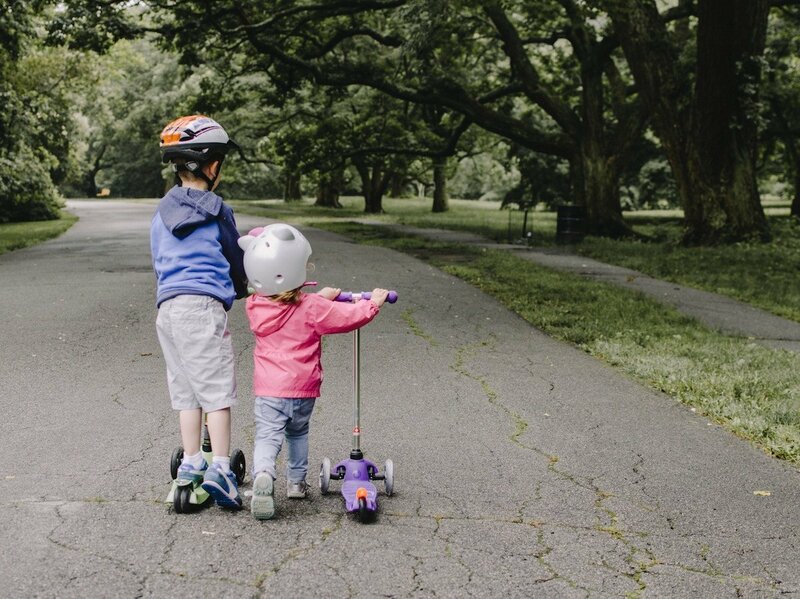 We think the best electric scooter for kids is the Razor E100. It is probably the most popular electric scooter for 8 or 9 year old children.